A sweltering second half for Nick Pratto carried over to the South Atlantic League playoffs. Kansas City's No. 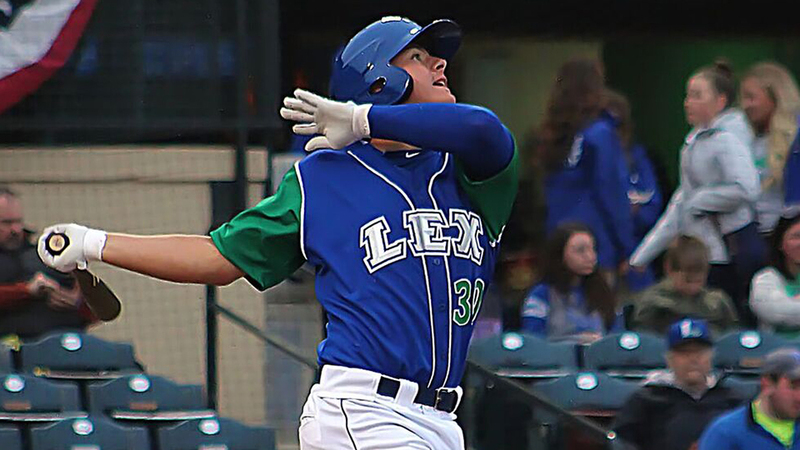 6 prospect belted a homer, plated two runs and stole two bases Wednesday night en route to Class A Lexington's 3-1 win over Rome in Game 1 of the best-of-3 semifinals at Whitaker Bank Ballpark. Pratto poked an RBI single to center field off Braves starter Alan Rangel to plate 14th-ranked Kyle Isbel in the first inning, then hammered a 1-1 offering over the fence in left in the sixth to put the Legends up, 3-1. "[Rangel] was working me away with the fastball tonight and he left one that caught a little bit of plate, I got barrel on it," Pratto said. "It felt good to see it go over. We had a little mixup because there's a chain-link fence on top of the wall and it hit that, but I knew that four umpires couldn't miss that ... because I heard it hit the fence." Kansas City's first-round pick in 2017 posted solid numbers in his first full-season of pro ball, compiling a .280/.343/.443 slash line with 14 homers and 22 stolen bases for the Legends. Pratto was a significant part of Lexington's road to the playoffs by hitting .322/.394/.518 in the second half. The Legends nabbed the Southern Division second-half title with a 39-31 record. "For me, it was just sticking with my approach and not getting caught up in outside factors," Pratto said. "Toward the half, things started to feel a lot better with my approach and I was getting prepared and everything. I just kept that going for the months to come. ... I started off pretty well, but once I started to struggle, things just started to spiral. I didn't handle it like I should have and I'm happy I got back to a place where I'm comfortable and started hitting again." Rome knotted the score in the fifth on Hagen Owenby's solo homer to left-center, but Sebastian Rivero plated the go-ahead run with an RBI single to center in the bottom of the frame. Lexington starter Jackson Kowar (1-0), the Royals' No. 4 prospect and the club's compensation-round selection in June's Draft, allowed one run on five hits without a walk while striking out five over five innings. Tad Ratliff relinquished a two-out double to Drew Lugbauer in the ninth, but induced Trey Harris to ground out to second to pick up the save. Rangel (0-1) allowed three runs -- two earned -- on five hits over five innings. He struck out nine and walked one. The series will shift to State Mutual Stadium in Rome, Georgia for Game 2 at 7 p.m. ET on Friday. Royals No. 8 prospect Daniel Lynch is scheduled to face off against the Braves' Walter Borkovich.